Writers Ivan Brandon (DRIFTER, Wolverine) and Jason Latour (SOUTHERN BASTARDS, Spider-Gwen) team up with artist Greg Hinkle (THE RATTLER, AIRBOY) and colorist Matt Wilson (THE WICKED + THE DIVINE, PAPER GIRLS) for all-new dark fantasy series BLACK CLOUD this April from Image Comics. Zelda was born in a world of dreams, and hers burned bigger than anyone had ever seen. Now she's on the run in our world, the dreams broken in her hands. But the pieces are for sale, the rich and the powerful are buying, and suddenly her world isn't the only place Zelda's running from. 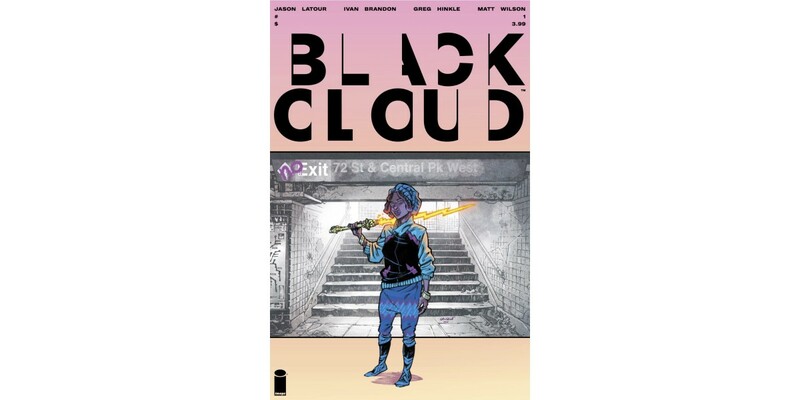 “Even though it's conceived as a pretty unfettered comic book kind of idea, BLACK CLOUD just seems to grow to fit and reflect the life that's happening around us in real time,” said Latour. “With each passing day, we're reminded more and more of how the stories we consume and tell ourselves really do define our world. Just like real life, this is a story about fact and fiction fighting for supremacy—only here, one of them has a lightning sword." Dreams come true—and today, they go to war. BLACK CLOUD #1 (Diamond code: FEB170540) hits comic book stores on Wednesday, April 5th. The final order cutoff deadline for retailers is Monday, March 13th.